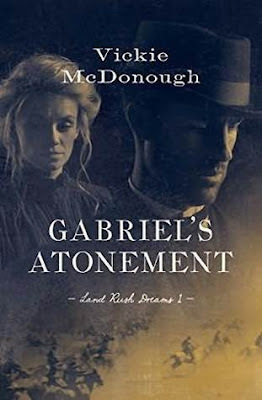 Gabriel's Atonement by Vickie McDonough attracted me because of the blurb which is interesting and arrests the reader's attention at once. This is the story of Gabriel, a pro gambler with no regrets in his life until an incident changes his life forever and throws him in to throes of guilt; and Lara who has had a rough life and then to add more sorrow and hardship to her life, there happens an incident that forces her life to crumble again. I sat glued and intrigued by the story right from the first page and felt a myriad of emotions all through the story. The characters are people who soon made a place in my heart and though not perfect, these are people who are realistic and though flawed are ready to redeem for their mistakes. I loved Vickie's writing style and was thrown head first into a story that captured my interest as well as my heart. I cried, sighed, felt angry, hopeless and then thankful all in the span of one story. The world building is splendid and the author took me to a time so different from the present time and had me feeling like I was right there, experiencing it all myself! All in all, Gabriel's Atonement by Vickie McDonough is a heartfelt story that touched me and I absolutely loved reading it. 4.5 out of 5 to it and recommended to everyone. I enjoyed Vickie McDonough's writing style and look forward to reading more from her in the future.